It has been a long-standing policy of Horsham District Council (HDC) that a country park should be formed out of the Sandgate Park Quarry and surrounding quarries and land. Over time the concept of the Country Park has developed in line with changes in local pressures, patterns (such as demographics) and expectations. Also the status of some of the various sites which could eventually form the Country Park has changed. Before 1887 the Sandgate Estate covered about four thousand acres to the north of the Storrington – Washington Road. The estate was centred on Sandgate House and its surrounding ornamental park immediately to the north of the road. The break-up of the estate started in 1887, on the death of George Carew Gibson. The break-up was continued by W.V Felton in 1917. Much of the land forming the bulk of the estate has been developed, a great deal of it for residential purposes. Some of the land is farmed. The house and its surrounding parkland remained in private hands until soon after the end of World War 2 when it was purchased by commercial sand extraction companies. The house was soon demolished with only some stables and outbuildings initially retained for the use as offices and stores. Sandgate Conservation Society’s concept for the Country Park started off with the areas of land that already had public access: Sandgate Park; Sullington Warren; and Warren Hill, and then to take advantage of any opportunity to join these existing sites with a footpath and where possible to increase the area of land with public access. In recent months significant progress has been made towards realising the vision of Sandgate Country Park – this is described below. Sandgate Conservation Society has worked, and will continue to work, to help ensure the best possible outcome for Sandgate Country Park by such activities as commenting on planning applications, getting involved in such consultations like the County Minerals Plan; neighbourhood plans; and the Horsham Strategic Plan, and raising issues with local councillors. The map shows the approximate locations and extents of the quarry and ex-quarry sites on either side of the Hampers Lane relevant to the formation of Sandgate Country Park. Each area, and its current status in relation to the concept of the Country Park, is described below. This area is owned by Cemex. There are two parts to the Sandgate Quarry site – the working quarry area and the area in the north where quarrying work has already finished. Although the permit for sand-winning extends to 2042 it is highly likely that profitable quarrying activities will cease well before that date. The aspiration for the working quarry area of the site is that this should form the core of the Country Park with potential water based recreation activities when quarrying stops and the Society is turning its attention towards how it can help ensure that this aspiration is met. In the northern part of the site restoration work and tree planting has already been carried out. 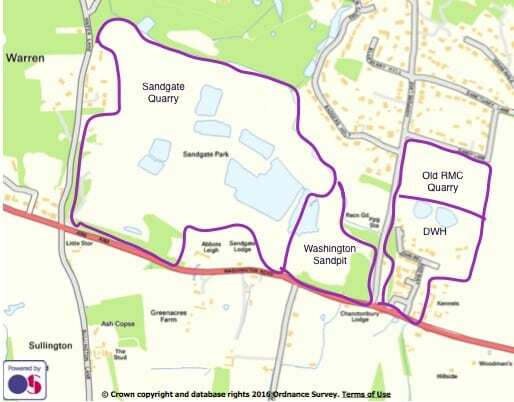 This area has been designated as part of Phase 1 of Sandgate Country Park within the context of the Millford Grange development planning application, along with the old RMC quarry area (see below). As of September 2018 enabling works commenced on this area enable public access and connecting paths into Sandgate Park, with barriers to prevent public access to the working quarry, providing fascinating views of the quarries and far reaching views to the South Downs. There is now public access to this area though there are some outstanding details regarding access into Sandgate Park and other ‘snagging’ matters. It is hoped that in the future there may be a path through to Hampers Lane once the restoration of the Washington Sand Pit is completed. This site, previously owned by Hanson, is now owned by Britaniacrest Recycling Ltd. This site has planning consent, granted 1st May 2015 (recorded by HDC as DC/13/2460), for the continuation of mineral extraction for a two year period and the importation of inert material over a five year period only, to enable the restoration of mineral working at Washington Sandpit for the long term benefit of the Sandgate Country Park. This planning permission was varied in 2018 (recorded by HDC as NC/18/004 and by WSCC as WSCC/009/18 /SR) to allow sand extraction until 31 December 2019 and requiring the importation of material by road to cease and the restoration of the land to be completed by 1st May 2020. A path along the northern boundary of this pit from Hampers Lane connecting to a path running along the northern edge of the Sandgate Quarry would provide an off-road path from Water Lane to Hampers Lane that avoids encroaching on the privacy of residents of Badgers Holt. This site, previously owned by RMC and then Cemex, was acquired by Barratt Homes (developed under their brand – David Wilson Homes). This site is of significance in respect of the Country Park because the planning application for the Millford Grange Housing Development includes the implementation of Phase 1 of Sandgate Country Park. Phase 1 of Sandgate Country Park comprises the site to the north of this development (the Old RMC Quarry, see below), plus approximately 18.5 acres of the Sandgate Quarry site – the restored northern area as described above – and connecting footpaths. Phase 1 of Sandgate Country Park is described in the Long Term Landscape Management Strategy for Phase 1 of Sandgate Country Park, which was submitted by Barratt Homes as part of the proposal for Millford Grange. It was partially on the basis of the provision of Phase 1 of Sandgate Country Park that this planning application was allowed on appeal. Millford Grange Appeal Decision Paragraphs 87-93 and 116 refer. Old RMC Quarry – 11 acres approximately. This site was also acquired by Barratt Homes from Cemex. Under the terms of the Long Term Landscape Management Strategy Barratt Homes was responsible for carrying out the works to change the site from private land to country park, and to maintain this part of the Country Park for 25 years thereafter. It is understood that ownership of this area transferred to the homeowners at Millford Grange as part of the terms of transfer when they purchased their properties and that responsibility for maintenance of the area will be transferred to a management company under the control of the Millford Grange residents in due course. This area is now accessible by the public via a gate on Hampers Lane, opposite Badgers Holt. Paths have been laid and a number of benches installed. While the area currently looks unkempt there is evidence of butterfly and bee friendly wildflowers and shrubs and it is expected that nature will soon make the area more attractive. There is onward access to Georges Lane, via a newly defined path created by the National Trust across their field, to the east of this site. The NT path emerges onto Georges Lane near the NT Warren Hill car park providing a link to the existing public footpath across Washington Common to the A24 underpass.